This t-shirt tells the world how you think about aliens. 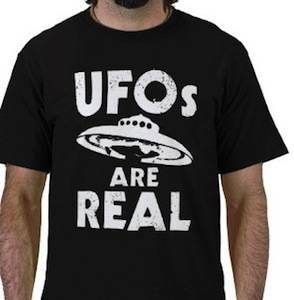 On this t-shirt you see a big UFO and the words “UFOs are real”. Not only is this t-shirt just fun it is also a great shirt to tell the world what you believe in or maybe not believe in. And yes you can get this shirt in a lot of colors and styles. Time to fly out of space with this UFO’s Are Real T-Shirt.